You can tell a lot about a person by the clothes they wear. Just one glance and you can imagine where that person lives, what they do for a living, how much money they have and how they feel about their lives in general. Or can you? ‘Clothes make the man’ is an age-old idiom that means just that: you are what you dress to be. The practical usage of clothing has long been secondary to its actual function, hasn’t it? Yes, practically speaking, we clothe ourselves to stay warm and protect our soft, unshielded exteriors from the harsh elements. But clothing is a personal expression and always has been. Cavemen wore skins and furs, if you believe modern interpretation of that period, but I’ll bet the head caveman had the thickest, most luxurious fur. The higher the social standing, the more people could afford to adorn themselves with better skins, more costly fabrics and decorations of all sorts. Since 2012, the German National Museum in Nuremberg has been restoring and cataloguing their collection of Early Modern clothing. The last update of this collection took place in 1926 and was never completed. Along with their own pieces and other archeological findings, the museum is opening an exhibition on December 3rd 2015 to display clothing of the period. 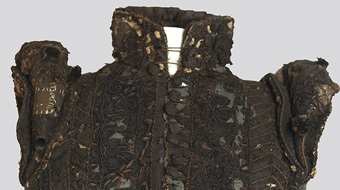 Along with this collection and other pieces on loan from other museums, they will be reconstructing a tailor’s workshop and addressing the very strict dress code in Germany in the 1600’s. This entry was posted in Germany, Nürnberg on August 24, 2015 by lauralibricz.